We just had our “School’s Back, Mom Relax” event last week, and a lot of the moms I talked with were experiencing some serious back-to school-stresses. They’re dealing with a whirlwind of new schedules, friends, and challenges – for the children and parents. The cost for each series is $325, which includes the six classes, course materials, and a copy of the “Common Sense Parenting” book. They even offer childcare if you need it. 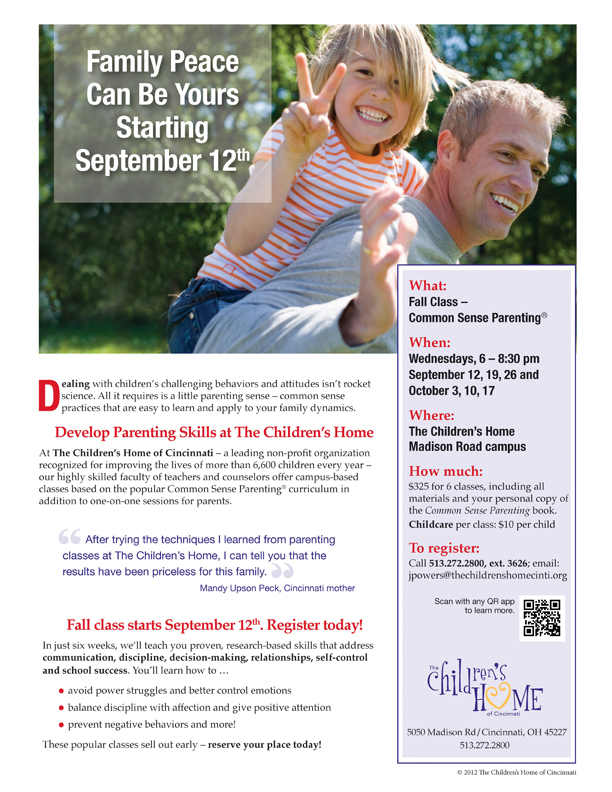 If you’d like to learn more about the series, or to register, email Jennifer Powers at JPowers@thechildrenshomecinti.org or call 513-272-2800 x3626. Should you be interested in more one-on-one specialized services, they also offer individual parent consultation at your home, on campus or over the phone for an hourly rate. I first found out about the The Children’s Home of Cincinnati through my work with Star64. We did a shoot there where I got to meet faculty, students and their families. It was such an eye-opening experience for me to see how The Children’s Home of Cincinnati was truly making a difference for the kids and bringing peace to their families. One of the stats that stuck with me the most from the shoot is that 100% of parents who have experienced group consultation thus far would recommend it to another family – that’s pretty impressive! To learn more about The Children’s Home of Cincinnati, go to www.thechildrenshomecinti.org.